The FBI has questioned the girlfriend of the gunman who shot and killed 58 concertgoers in Las Vegas. Detectives hope to discover what motivated Stephen Paddock to open fire on a country music festival in the deadliest mass shooting in recent US history. Marilou Danley, who returned to the United States late yesterday, is a "person of interest" in the investigation, Las Vegas police have said. Her relatives in the Philippines told reporters she had a "clean conscience" and no prior knowledge of the attack. More than 500 people were injured, some trampled in the pandemonium, when Paddock, 64, fired bullets from his 32nd-floor hotel room for about 10 minutes on Sunday night. He killed himself before police stormed his room, where they found as many as 23 guns, bringing the total death toll to 59. Twelve of his rifles were fitted with so-called bump stocks, officials said, allowing the guns to be fired almost as though they were automatic weapons. 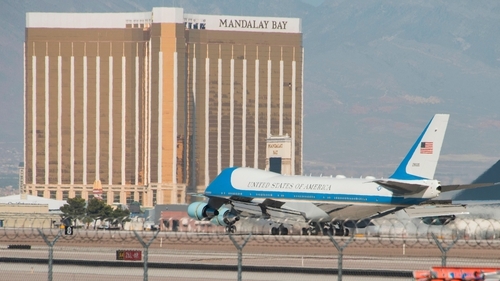 US President Donald Trump has visited Las Vegas to pay his respects and support first responders, marking the first time he has had to deal as president with a major mass shooting of the type that have killed hundreds of people in recent years in the United States. Investigators have focused on Ms Danley, 62, who once lived with Paddock and left the US for the Philippines in September. The Federal Bureau of Investigation met her plane from Manila at Los Angeles International Airport and took her away for questioning, said two US officials briefed on the case. As of midday local time, there was no indication she was aware of Paddock's plans, the officials said. They were questioning her about his weapons purchases, a $100,000 wire transfer to a Philippine bank that they think may have been intended for her, and about whether she saw any changes in his behavior before she left the US. "Assuming she had no role in his actions, the most important thing is any light she can shed on Paddock's motive," said the official, who spoke about the continuing investigation only on condition of anonymity. Ms Danley, who has retained Los Angeles-area defense lawyer Matthew Lombard, had assured her family she has a "clean conscience," her brother told ABC News in the Philippines. "I called her up immediately and she said, 'Relax, we shouldn't worry about it. I'll fix it. Do not panic. I have a clean conscience,'" Reynaldo Bustos told ABC in Manila. Paddock's brother Eric told reporters the $100,000 transfer was evidence that "Steve took care of the people he loved," and that he likely wanted to protect Ms Danley by sending her overseas before the attack. "He manipulated her to be completely as far away from this and safe when he did this," Eric Paddock said yesterday. Ms Danely arrived in Manila on 15 September, flew to Hong Kong on 22 September and returned to Manila on 25 September. She was there until she flew to LA last night, according to a Philippine immigration official. While Ms Danley has not been arrested nor identified as a suspect, one expert noted that that was also the case for the wife of the shooter who killed 49 people at the Pulse nightclub in Orlando last year, previously the deadliest shooting spree in modern US history. Pulse shooter Omar Mateen was killed in a shootout with police. Mateen's wife, Noor Salman, cooperated with investigators but was later indicted for aiding and abetting her late husband in support of the so-called Islamic State group. "She cooperated her way right into a criminal indictment," said Los Angeles criminal defense attorney Mark Geragos. However, Geragos said, "Mere presence is not necessarily something that's going to get you indicted in most jurisdictions." Mr Trump, touring a hospital in Las Vegas, told reporters Paddock was "very demented" but that investigators still had not nailed down a motive for the shooting. "We struggle to explain to our children how such evil can exist," he said later at Las Vegas police command center. Meeting with law enforcement officers who rushed toward the shooter, Mr Trump asked the head of the Las Vegas Metropolitan Police Department if investigators were any closer to establishing a motive. "We've had a couple good leads and we're working our way through it," Sheriff Joseph Lombardo told the president.